Make a regular date to spend Mondays with your muse. 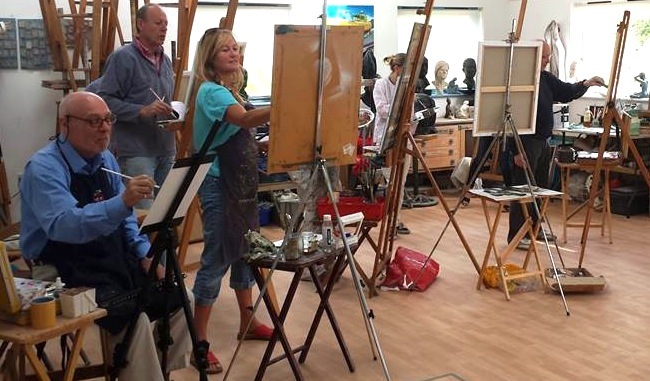 In this class you will learn how to draw, and improve your existing drawing skills, and learn to paint people and landscapes using oil paints. The morning will be spent doing (an optional) drawing exercise that will focus on a specific theme. In the afternoon you will be free to explore on your own ideas or inspiration with Sally moving around the room offering advice where needed. Sally’s tutoring philosophy is very much about showing you range of techniques and options, then allowing you choose what styles work best for you. She is never prescriptive but will inspire you to discover and develop your own creative practise. Please contact Sally direct if you would like to attend for part of the term. *including tuition, use of easel and refreshments. You will need your own oils, canvas and paper. Please contact Sally for guidance.